Incorporating a completely new internal design, heavy duty spindle with double ‘o’ ring and backup ring for total sealing and smooth operation. The spindle has a large 7.5mm square drive along with the 15.7mm diameter Teflon coated threaded seat with a polyamide insert. 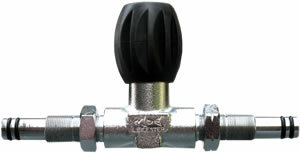 The new valves are operated by a large 40mm diameter tactile grip handwheel, and the valve body is temperature stress relieved after machining which eliminates the risk of stress cracking in later service. The valve is designed and manufactured in accordance with CE97/23, CE99/36, EN ISO 10297:2006 & UNI EN250 (Thread Form M25 x 2), including full certification for CE O2 adiabatic compression tests together with Pi mark impact testing.